GM will start selling the four-door Baojun 630 compact sedan early this year through its SAIC-GM-Wuling Automotive Co. joint venture. This picture was released Thursday, Jan. 27. SHANGHAI (Bloomberg) -- Tour guide Chen Libin is waiting for General Motors Co. and Honda Motor Co. to roll out their new China-only brands before replacing his Xiali A+ sedan. Chen will spend up to 80,000 yuan ($12,153) on a car he'll drive 300 kilometers (186 miles) a day around the Inner Mongolia grasslands. Models by domestic automakers such as Tianjin FAW Xiali Automobile Co. start breaking down after two years, while foreign cars go at least five years without major problems, he said. GM, Honda and Nissan Motor Co. are creating unique brands for the world's biggest car market as they try to boost sales in China's interior, where incomes rose almost 11 percent last year. The cheaper nameplates will help them compete on price against local manufacturers without diluting their cachet among Chinese buyers, said John Zeng, an industry analyst at J.D. Power & Associates in Shanghai. These “low-budget cars” will use older model platforms and have few extra features, said Leah Jiang, an analyst with Macquarie Research Ltd. in Shanghai. Antilock brakes, automatic air conditioning and reclining seats may be excluded to keep prices as low as 50,000 yuan, said Koji Endo, an auto analyst at Advanced Research Japan in Tokyo. That market segment is dominated by domestic automakers BYD Co., Geely Automobile Holdings and Chery Automobile Co. Local brands sold three of every four cars priced below 50,000 yuan, and more than half of those costing between 50,000 and 80,000 yuan, Jiang said. Vehicle sales grew more than 32 percent to almost 18.1 million in 2010. Sales are expected to grow about 15 percent this year, with about two-thirds of buyers coming from cities where the average annual income is less than $5,000, according to J.D. Power figures. The economy likely will grow 9.8 percent this year, the state-run China Daily newspaper reported this week, citing a government academy. Government officials have indicated that the country's upcoming five-year plan will make a renewed push to boost domestic consumption. GM, which hasn't announced Baojun prices, is targeting 15 percent growth next year after sales increased 29 percent last year to 2.35 million vehicles. Tier-one cities include wealthier Shanghai, Beijing and Guangzhou, according to the National Bureau of Statistics. The second tier includes provincial capitals and the third includes smaller cities. 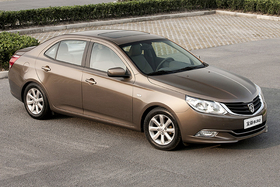 Honda and local partner Guangzhou Automobile Group Co. expect to start selling the Li Nian S1 sedan early this year. The brand, which means “ideal,” uses the City platform and targets entry-level consumers with 1.3- and 1.5-liter engines, the Tokyo-based company said. The company declined to comment on the price. Honda sales in China increased 12 percent last year and are expected to grow 10 percent this year, the company said. Nissan and local partner Dongfeng Motor Group Co. said their upcoming Qi Chen, or “morning star,” will meet rising demand for cheaper models. They wouldn't comment on price, though Endo said it likely will be priced between 50,000 and 70,000 yuan. The car will have the “technologies, quality level, engineering standards” of a foreign brand, said Toshiyuki Shiga, NIssan's chief operating officer. Volkswagen AG, China's second-largest foreign car manufacturer, and local partners SAIC Motor Corp. and FAW Group Corp. also may create a China-specific brand, Karl-Thomas Neumann, the company's China CEO, said last week. Hao Hongfu, 32, is waiting for the Baojun before deciding on a replacement for his Beiqi Foton Motor Co. pickup.